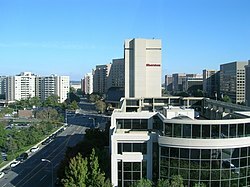 Amazon HQ2 is a planned new corporate headquarters in Crystal City, Arlington, Virginia, for online retailer and tech company Amazon. The location is intended to complement the company's existing headquarters in Seattle, Washington. Amazon announced its plans to build a new headquarters in September 2017, saying that it would house 50,000 workers and spend $5 billion on new construction. The corporation also invited governments and economic development organizations to give the corporation tax breaks and other incentives to entice it to their locality. More than 200 cities in Canada, Mexico, and the United States eventually offered tax breaks, expedited construction approvals, promises of infrastructure improvements, new crime-reduction programs, and other incentives. A shortlist of 20 finalists was announced January 18, 2018, after which the candidate localities continued to detail or expand their incentive packages. On November 13, 2018, Amazon announced that HQ2 would be split into two locations, with 25,000 workers at each: National Landing, a future neighborhood including Crystal City in Arlington, Virginia, and Long Island City in Queens, New York City. Amazon also announced that downtown Nashville, Tennessee, would be the new "Center of Excellence" for its operations business, adding 5,000 new jobs. Virginia will provide $573 million in tax breaks, $23 million in cash, and other incentives. New York planned to give Amazon tax breaks of at least $1.525 billion, cash grants of $325 million, and other incentives. Amazon later pulled out of the New York location three months later after opposition from some residents and local politicians. Amazon was founded in 1994 in Bellevue, Washington, and moved to leased space in the SoDo neighborhood of Seattle. As the company grew, it went through a series of office moves around Downtown Seattle, until announcing a move to a purpose-built headquarters campus in the South Lake Union neighborhood, then a light industrial enclave undergoing urban renewal. As of 2017[update], Amazon occupies 8.1 million square feet (750,000 m2) of office space in 33 buildings, employing 40,000 white collar workers. Amazon's request for proposals outlined several core requirements, as well as optional preferences. Optional preferences included airports with direct flights to Seattle, New York City, San Francisco, and Washington, D.C., urban locations, and proximity to major universities. The deadline for Phase I bids was set at October 19, 2017. A final site was planned to be selected and announced in November 2018, from a shortlist of 20 cities released in January. As of October 23, 2017[update], 238 proposals had been submitted and received by Amazon, representing cities and regions from 54 states, provinces, districts, and territories. The only U.S. states that did not have a locality that submitted a formal proposal were Arkansas, Hawaii, Iowa, Montana, North Dakota, South Dakota, Vermont, and Wyoming. The Canadian provinces of New Brunswick and Saskatchewan also had no regions submit a bid, along with the Yukon Territory. Little Rock, Arkansas and San Antonio, Texas later withdrew their submission. Sun Corridor, a Tucson, Arizona economic development firm, sent a 21-foot saguaro cactus to Amazon in an attempt to promote the city's bid. The gift was rejected due to the company's corporate gifts policy, instead donating it to the Arizona-Sonora Desert Museum. The city of Stonecrest, Georgia, a suburb of Atlanta, voted to de-annex 345 acres (140 ha) of land for Amazon to establish its own city named Amazon around its headquarters. Sly James, mayor of Kansas City, Missouri, purchased 1,000 products from Amazon, which he donated to charity. James wrote 5-star reviews for each one of them, in which every review mentioned positive attributes of Kansas City. Primanti Brothers, a chain of sandwich shops based in Pittsburgh, offered free sandwiches to Amazon employees if they chose the city as their second headquarters. The city of Birmingham, Alabama erected several giant Amazon boxes and dash buttons around public areas. The dash buttons sent out pre-generated tweets to lure Amazon to the city. New York City mayor Bill de Blasio announced that major landmarks in the city would be lit in orange to promote the city's campaign for HQ2. For one of Canada's many bids, messages hoping to persuade Amazon to move to Calgary were sprayed onto sidewalks in Seattle's South Lake Union neighborhood. During an Ottawa Senators hockey game, fans were encouraged to "make noise" for the city of Ottawa's Amazon bid. Contrary to other cities, Little Rock, Arkansas, purchased a full-page ad in The Washington Post "breaking up" with Amazon, where they described their decision to not submit a bid, while also touting the city's positive attributes. A few days after the bid deadline, the campaign flew a banner plane over Seattle with the same message. On January 18, 2018, Amazon announced its shortlist of 20 finalists for the HQ2 bidding process. The list focuses mainly on the U.S. East Coast and Midwest, with Los Angeles the only selection from the West Coast and Toronto the only one outside of the United States. In November 2018, The Washington Post and the Wall Street Journal reported that several finalists were in advanced talks with Amazon over the HQ2 decision, including the potential choosing of Crystal City in Northern Virginia. Amazon Director of Economic Development Mike Grella wrote on Twitter that the leaker responsible for informing the newspapers was violating a non-disclosure agreement. Grella also criticized media outlets for speculating on the winning bid for HQ2 based on the travel patterns of Amazon CEO Jeff Bezos, who owns The Post. On November 5, 2018, it was speculated that Amazon was finalizing plans to divide HQ2 evenly among two locations: Crystal City in Arlington, Virginia, Long Island City in Queens, New York, or Dallas, Texas. Amazon declined to comment on the New York Times and Wall Street Journal reports. The selections of New York City and Northern Virginia for the HQ2 sites were confirmed early on November 13, 2018. Amazon made the official announcement later that day. In Amazon's announcement, a joint press release was presented by the Northern Virginia bidders that Amazon's HQ2 neighborhood location would officially be renamed "National Landing", which encompasses not only Crystal City but also the nearby areas of Pentagon City and Potomac Yard. Amazon also announced its new operations in Nashville in November. The subsidies offered to Amazon in New York include performance-based direct incentives of $1.525 billion based on whether the company created 25,000 jobs. This included a refundable tax credit through the state's Excelsior Program of up to $1.2 billion, calculated as a percentage of the salaries Amazon expects to pay employees over the following 10 years. Additionally, the Empire State Development Corporation would give Amazon a cash grant of $325 million based on the occupancy rates of HQ2 buildings over in the following 10 years. Under an agreement with New York City's government, half of the property taxes for the city's HQ2 campus would be waived, and the exempt amount would go to the city's PILOT (payment in lieu of taxes) fund to pay for infrastructure improvements in New York City. Meanwhile, Virginia offered performance-based incentives worth $573 million, which included a workforce cash grant of up to $550 million, based on whether Amazon created 25,000 jobs. Arlington County would also give an additional $23 million in cash grants, to be disbursed over 15 years, contingent on the gradual increased revenue from a tax collected from the county's hotel rooms. Both states proposed that Amazon be given access to a helipad, and the New York state government also promised to upgrade infrastructure in conjunction with HQ2's construction there. Nashville offered $102 million in performance-based incentives, plus a cash grant of up to $15 million based on each new job added. In addition, the Tennessee government offered a cash grant of up to $21.7 million based on each new job added. Amazon was said to have chosen New York City as one of the sites for HQ2 because of the city's highly skilled pool of talent; existing tech, finance, and media industries; and strong university system, including Columbia University and Cornell Tech. Former Seattle Mayor Ed Murray announced that he would begin conversations with Amazon about their long-term plans for the city, while the Seattle Metropolitan Chamber of Commerce characterized the announcement as a "wake-up call" to Seattle to improve the city's business climate. 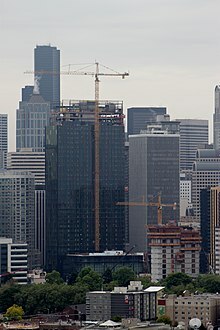 Comparisons were made to Boeing's decision to move its corporate headquarters from Seattle to Chicago in 2001, which came as a surprise to Seattle. Moody's Analytics published an analysis of bidding metropolitan areas and determined that Austin, Texas, ranks highest among Amazon's criteria, followed by Atlanta, Philadelphia, and Rochester, New York. The New York Times also completed an analysis which found Denver to be the best site based on Amazon's criteria, followed closely by Boston and Washington, D.C. Irish gambling site Paddy Power originally listed Atlanta as the odds on favorite to win HQ2, with 2-to-1 odds, but as of January 2018, listed Atlanta and Austin as sharing 3-to-1 odds of winning Amazon HQ2. Some of the finalists and rejected bids have used their Amazon proposals to attract investments from other multinational corporations. Steven Strauss, a visiting professor of public policy at Princeton University and an expert on economic development, in an editorial in USA Today suggested that metropolitan areas should be cautious about bidding too generously to win the Amazon bid. He pointed to examples where companies have gone bankrupt or failed to follow up on expansion plans. Strauss also wrote that it was possible that cities could over-pay (the so-called "winner's curse") by providing an overly generous incentive package, which would turn out to be a money-losing proposition for the municipality if all the promised jobs did not materialize. Conservative and liberal advocacy groups voiced their opposition to various tax breaks promised by cities in hopes of luring Amazon. In early 2018, New York University Stern School of Business professor Scott Galloway predicted that HQ2 would be located in either the New York metropolitan area or the Washington metropolitan area; with the decision to create two locations, Galloway ended up predicting both correctly. He repeatedly called the competition a "ruse" and a "con". Galloway said that "the game was over before it started", claiming that the proximity to both Bezos' home and the capital made the DC area an obvious choice, and that soliciting bids from places that they never intended to move to was solely to gain tax breaks. After the HQ2 campus in New York City was announced, officials representing parts of Queens, such as U.S. Representative-elect Alexandria Ocasio-Cortez, Councilman Jimmy Van Bramer, State Senator Michael Gianaris, and Assemblyman Ron Kim, announced their disapproval. Ocasio-Cortez, Van Bramer, and Gianaris all expressed concern that Amazon would receive tax breaks while critical infrastructure, such as the New York City Subway, was deteriorating, and the city's public school and health care systems were underfunded. In a Twitter post, Ocasio-Cortez raised further concerns about the affordability of housing in Queens, since housing prices around the HQ2 campus in Queens began rising in anticipation of the campus's construction. Kim and Fordham University professor Zephyr Teachout wrote an opinion piece in The New York Times in which they stated that the city should "not offer incentives and giveaways to an internet giant known for squashing small businesses." Politico reported that the Long Island City location would be built on land intended for 6,000 homes, including 1,500 affordable homes, to which State Senator Michael Gianaris said, "The more we learn about this deal, the worse it gets." On February 14, 2019, Amazon announced that it would cancel the planned Long Island City location due to opposition. The company also said that it would continue developing the Crystal City and Nashville locations. The New York Times reported that de Blasio and Cuomo were "blindsided" by Amazon's decision when informed by Amazon VP Jay Carney. New York governor Andrew Cuomo blamed Democrats in the New York State Senate for the cancellation, and New York City mayor de Blasio said that Amazon "threw away that opportunity," by making the announcement. In response, Ocasio-Cortez stated: "If we were willing to give away $3 billion for this deal, we could invest $3 billion in our district ourselves if we want to. We could hire more teachers, we can fix our subways, we can put a lot of people to work for that money if we wanted to." Mayor de Blasio, among others, criticized her, and those who had made similar remarks, for suggesting the money, mostly in the form of tax credits, was now free to be spent elsewhere. Activist organizations also argued that, in Amazon's absence, the original plans to build 6,000 homes should be re-adopted. In the weeks following Amazon's decision, Governor Cuomo phoned multiple Amazon executives and even Jeff Bezos, personally asking them to reconsider and guaranteeing them "support." The Partnership for New York City placed an open letter in The New York Times stating that Cuomo "will take personal responsibility for the project's state approval." The letter is signed by Hakeem Jeffries, Carolyn Maloney, Andrew D. Hamilton, David M. Solomon, David N. Dinkins, and Ajay Banga, among others. ^ "Amazon HQ2". Amazon.com. September 2017. Retrieved September 20, 2017. ^ a b Day, Matt (September 19, 2017). "Amazon refuses Arizona's cactus as bidders for HQ2 climb to 118". The Seattle Times. Retrieved September 20, 2017. ^ a b c Wingfield, Nick (January 18, 2018). "Amazon Chooses 20 Finalists for Second Headquarters". The New York Times. Retrieved January 18, 2018. ^ a b Stevens, Laura; Morris, Keiko; Honan, Katie (November 13, 2018). "Amazon Picks New York City, Northern Virginia for Its HQ2 Locations". Wall Street Journal. Retrieved November 13, 2018. ^ a b "Amazon selects New York City and Northern Virginia for new headquarters". US Day One Blog. November 13, 2018. ^ Cooke, Kyle (November 12, 2018). "Reports: Amazon HQ2 to be split between New York City and Northern Virginia". WSMV Nashville. Retrieved November 13, 2018. ^ Press |, The Associated (November 13, 2018). "Amazon HQ2: Breaking down the tax breaks". The Mercury News. Retrieved December 27, 2018. ^ "Amazon Selects New York City and Northern Virginia for New Headquarters". Amazon. November 13, 2018. Retrieved December 31, 2018. ^ a b McCartney, Robert; O'Connell, Jonathan (February 14, 2019). "Amazon Drops Plan For New York City Headquarters". The Washington Post. ^ Brewster, David (October 1, 2007). "Amazon plans a headquarters move to South Lake Union". Crosscut.com. Retrieved September 20, 2017. ^ Belko, Mark (October 16, 2017). "Seattle brewed: Amazon's rapid growth transforms a city—but it's complicated". Pittsburgh Post-Gazette. Retrieved October 19, 2017. ^ "knowhq2.com". knowhq2.com. Retrieved February 14, 2019. ^ a b "Amazon HQ2 RFP" (PDF). Amazon.com. September 7, 2017. Retrieved September 20, 2017. ^ a b Bhattarai, Abha (September 7, 2017). "Amazon is seeking a home for its HQ2, a $5 billion second headquarters somewhere in North America". The Washington Post. Retrieved September 20, 2017. ^ a b Day, Matt (October 19, 2017). "Cities crank up publicity stunts as Amazon's HQ2 bid deadline arrives". The Seattle Times. Retrieved October 19, 2017. ^ Bomey, Nathan (October 19, 2017). 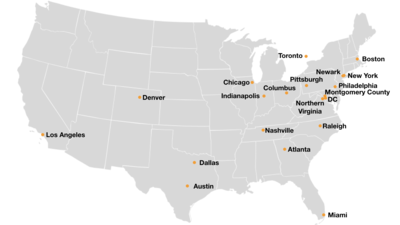 "See the cities hoping to land 50,000 Amazon jobs, headquarters". USA Today. Retrieved October 20, 2017. ^ "Amazon HQ2". Amazon.com. October 2017. Retrieved October 23, 2017. ^ "Amazon says it received 238 proposals for 2nd headquarters". Las Vegas Sun. Associated Press. October 23, 2017. ^ Wingfield, Nick (October 23, 2017). "Amazon Counts Its Suitors: 238 Want to Be Home for 2nd Headquarters". The New York Times. Retrieved January 18, 2018. ^ Demillo, Andrew (October 19, 2017). "Little Rock drops Amazon bid in ad: 'It's not you, it's us.'". US News. Associated Press. Retrieved June 24, 2018. ^ Alex Zielinski (October 11, 2017). "San Antonio Drops from Race to Become Amazon's Second Headquarters". Rivard Report (blog). Institute for Nonprofit News. ^ Wingett Sanchez, Yvonne (September 19, 2017). "Amazon rejects Tucson's gift of a 21-foot saguaro cactus". Arizona Republic. Retrieved October 3, 2017. ^ Niesse, Mark (October 3, 2017). "City of Amazon proposed to attract company's HQ2 to Georgia". Atlanta Journal-Constitution. Retrieved October 3, 2017. ^ a b c d e Liao, Shannon (October 19, 2017). "The eight most outrageous things cities did to lure Amazon for HQ2". The Verge. Retrieved October 21, 2017. ^ Demillo, Andrew (October 19, 2017). "Little Rock drops Amazon bid in ad: 'It's not you, it's us.'". ABC News. Retrieved October 21, 2017. ^ Schlosser, Kurt (October 23, 2017). "Banner day for Little Rock, Ark., as city flies 'no thanks' message to Amazon over Seattle". GeekWire. Retrieved October 23, 2017. ^ Day, Matt (January 18, 2018). "Amazon names 20 finalists in search for HQ2". The Seattle Times. Retrieved January 18, 2018. ^ Austen, Ian (January 18, 2018). "Why Toronto Made 'the Playoffs' for Amazon's Headquarters". The New York Times. Retrieved January 18, 2018. ^ "In The Running For Amazon's HQ2, Suffolk Downs Turns Toward Redevelopment". WBUR. ^ "Chicago officially announces 10-site bid for Amazon's 'HQ2' headquarters". Curbed. ^ "Documents detail Columbus' bid to lure Amazon's 2nd HQ". The Columbus Dispatch. ^ "Amazon has announced the top contenders in its $5 billion bidding war for HQ2 — here are their craziest proposals". Business Insider. ^ "Amazon Officials Revisit HQ2 Contenders New York City, Newark, and Chicago. But 1 Big Clue Suggests a Different Choice". Inc.com. October 20, 2018. Retrieved October 31, 2018. ^ "The three sites Philly is pitching to Amazon". The Philadelphia Inquirer. ^ "Breaking Down Toronto's 190-Page Amazon HQ2 Bid". Techvibes. ^ "What We Found Out About D.C.'s Bid For Amazon HQ2 — And What We Didn't". WAMU. ^ Rider, David (March 5, 2018). "As we watch Amazon, its 'HQ2' decision-makers are watching us". Toronto Star. Retrieved March 5, 2018. ^ Belko, Mark (March 5, 2018). "Amazon HQ2 visits have begun". Pittsburgh Post-Gazette. Retrieved March 5, 2018. ^ "If Jeff Bezos Makes Washington the Second Headquarters of Amazon". New Yorker. ^ Cappetta, Michael (May 16, 2018). "Amazon has finished visiting the top 20 contenders for its new HQ". NBC News. Retrieved May 17, 2018. ^ Kim, Eugene (September 13, 2018). "Jeff Bezos says Amazon will announce HQ2 decision before the end of the year". ^ Stevens, Laura; Calvert, Scott; Hobbs, Tawnell D. (November 4, 2018). "Amazon in Late-Stage Talks With Cities Including Crystal City, Va., Dallas, New York City for HQ2". Wall Street Journal. Retrieved November 4, 2018. ^ Baig, Edward C. (November 4, 2018). "Report: Northern Virginia may be winner of Amazon HQ2 sweepstakes; Amazon exec slams leak". USA Today. Retrieved November 4, 2018. ^ Soper, Spencer; Brody, Ben (November 3, 2018). "Amazon Exec Rips 'Leaking' to Bezos' Washington Post on Headquarters". Bloomberg News. Retrieved November 4, 2018. ^ "Amazon Plans to Split HQ2 in Two Locations". The New York Times. November 5, 2018. Retrieved November 6, 2018. ^ Green, Dennis (November 5, 2018). "Amazon plans to set up 2 different locations for its HQ2 - in New York and Virginia". Business Insider. Retrieved November 6, 2018. ^ Stevens, Laura; Raice, Shayndi (November 5, 2018). "Amazon Plans to Split HQ2 Evenly Between Two Cities". Wall Street Journal. Retrieved November 6, 2018. ^ "Everything we know about Amazon's HQ2 search". CNN. November 5, 2018. ^ "Amazon's Grand Search For 2nd Headquarters Ends With Split: NYC And D.C. Suburb". NPR.org. November 13, 2018. Retrieved November 13, 2018. ^ "Amazon's HQ2 will be split between NYC and Arlington, Virginia". Engadget. Retrieved November 13, 2018. ^ "Amazon Selects New York City and Northern Virginia for New Headquarters". Retrieved November 13, 2018. ^ "National Landing? Long Island City? This is where Amazon's headquarters are located". USA Today. ^ a b c Feiner, Lauren (November 13, 2018). "Amazon will get up to $2.2 billion in incentives from New York City, Northern Virginia and Nashville". CNBC. Retrieved November 14, 2018. ^ a b c "A $2 Billion Question: Did New York and Virginia Overpay for Amazon?". The New York Times. November 13, 2018. Retrieved November 14, 2018. ^ Raskin, Sam (November 16, 2018). "Amazon's HQ2 deal with New York, explained". Curbed NY. Retrieved November 17, 2018. ^ "A breakdown of the LIC Amazon HQ2 deal". am New York. November 14, 2018. Retrieved November 17, 2018. ^ "Strong university ecosystems feed Amazon HQ2 fire". CIO Dive. Retrieved November 30, 2018. ^ Beekman, Daniel; O'Sullivan, Joseph (September 7, 2017). "Amazon's announcement of HQ outside of Seattle sends ripples through state's political circles". The Seattle Times. Retrieved September 20, 2017. ^ Gates, Dominic (September 7, 2017). "Amazon plan echoes Boeing's move to Chicago, but differences are crucial". The Seattle Times. Retrieved September 20, 2017. ^ Belko, Mark (October 16, 2017). "Moody's ranks Pittsburgh, Philadelphia high on their potential to deliver Amazon HQ2". Post-Gazette. Retrieved October 17, 2017. ^ Badger, Emily; Bui, Quoctrung; Miller, Claire Cain (September 9, 2017). "Dear Amazon, We Picked Your New Headquarters for You". The New York Times. ISSN 0362-4331. Retrieved October 18, 2017. ^ Smith, Aaron (October 24, 2017). "Gambling site has Atlanta as the favorite in the Amazon sweepstakes". CNN Money. Retrieved October 24, 2017. ^ Allison, David; Pope, Colin. "Austin, Atlanta now share 3-to-1 odds of landing Amazon HQ2". www.bizjournals.com. Retrieved January 4, 2018. ^ "Cities Recycle Their Amazon Pitches to Attract New Business". Wall Street Journal. ^ "How the losing Amazon HQ2 cities can still win". CNN. ^ "Steven Strauss". Woodrow Wilson School of Public and International Affairs. August 4, 2014. Retrieved September 24, 2017. ^ Leonhardt, David (September 22, 2017). "Opinion | Take That, Jimmy Kimmel". The New York Times. ISSN 0362-4331. Retrieved September 24, 2017. ^ "The wooing of Amazon HQ2: Taxpayers, watch out for your wallets". USA Today. Retrieved September 24, 2017. ^ Valle, Gaby Del (November 6, 2018). "The backlash to Amazon HQ2, explained". Vox. Retrieved November 13, 2018. ^ Wong, Julia Carrie (March 15, 2018). "'Not welcome here': Amazon faces growing resistance to its second home". The Guardian. Retrieved March 15, 2018. ^ Green, Dennis (February 12, 2018). "The professor who predicted Amazon would buy Whole Foods says only 2 cities have a shot at HQ2". Business Insider. Retrieved November 14, 2018. ^ a b Johnson, Eric (November 9, 2018). "Amazon's HQ2 was a con, not a contest". Recode. Retrieved November 14, 2018. ^ Molla, Rani (September 19, 2018). "Watch: Scott Galloway's provocative predictions on Amazon, Walmart and the future of retail". Recode. Retrieved November 14, 2018. ^ Spencer, Christian (November 13, 2018). "Some Queens Pols Pushback Against HQ2 Coming To LIC". Queens County Politics. Retrieved November 13, 2018. ^ Pramuk, Jacob (November 13, 2018). "New York Democrats pick a fight with Amazon over HQ2 in Queens". CNBC. Retrieved November 14, 2018. ^ Warerkar, Tanay (November 13, 2018). "Queens officials come out against Amazon's HQ2 in Long Island City". Curbed NY. Retrieved November 14, 2018. ^ Goldenberg, Sally; Rubinstein, Dana (November 15, 2018). "Amazon deal will disrupt plans for affordable housing on Long Island City sites". Politico. Retrieved January 10, 2019. ^ Henney, Megan (February 13, 2019). "Tennessee 'very interested' in Amazon HQ2 after NYC strife". FOX Business. Retrieved February 14, 2019. ^ Goodman, J. David; Weise, Karen. "Why the Amazon Deal Collapsed: A Tech Giant Stumbles in N.Y.'s Raucous Political Arena". The New York Times. Retrieved February 16, 2019. ^ Stevens, Laura; Vielkind, Jimmy; Honan, Katie (February 14, 2019). "Amazon Cancels HQ2 Plans in New York City". The Wall Street Journal. Retrieved February 15, 2019. ^ "Amazon Pulls Out of Planned New York City Headquarters". The New York Times. February 14, 2019. Retrieved February 15, 2019. ^ Golding, Bruce (February 17, 2019). "De Blasio says Alexandria Ocasio-Cortez didn't understand Amazon deal". New York Post. Retrieved February 21, 2019. ^ Dontoh, Kyle; Berkovitz, Casey (February 17, 2019). "After Amazon, build more housing". New York Daily News. Retrieved February 21, 2019. ^ Goodman, J. David (February 28, 2019). "Cuomo Speaks With Bezos, Furiously Trying to Win Back Amazon". The New York Times. Retrieved February 28, 2019.